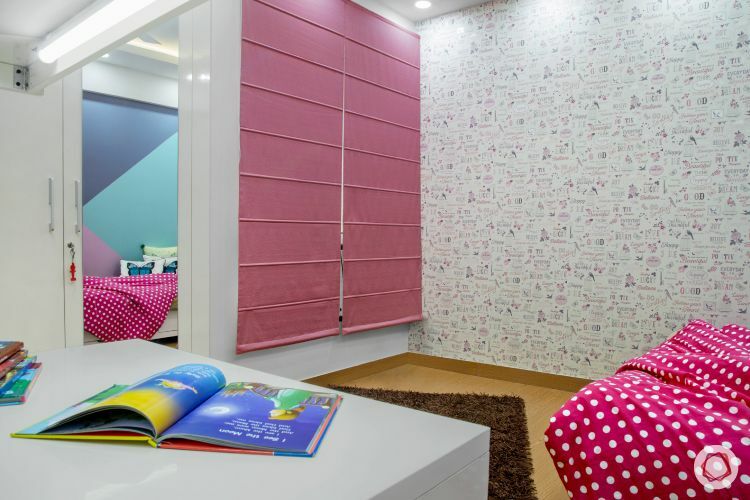 A peek into this bright home at Jaypee Greens. 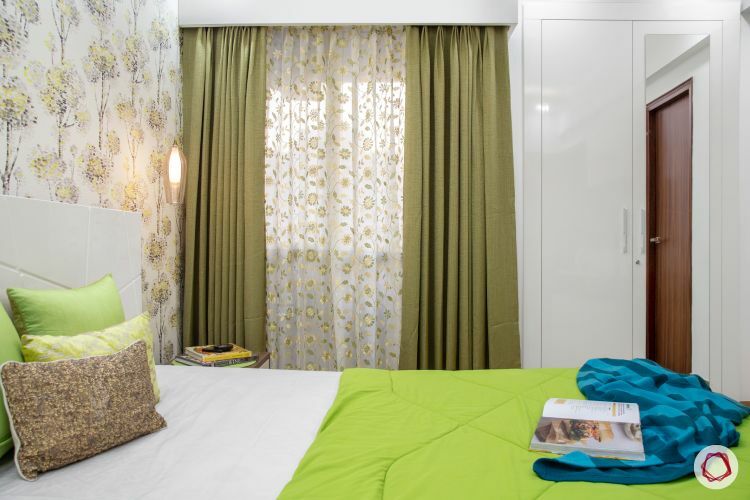 Size of home: A 3BHK spanning 1,100 sq ft approx. 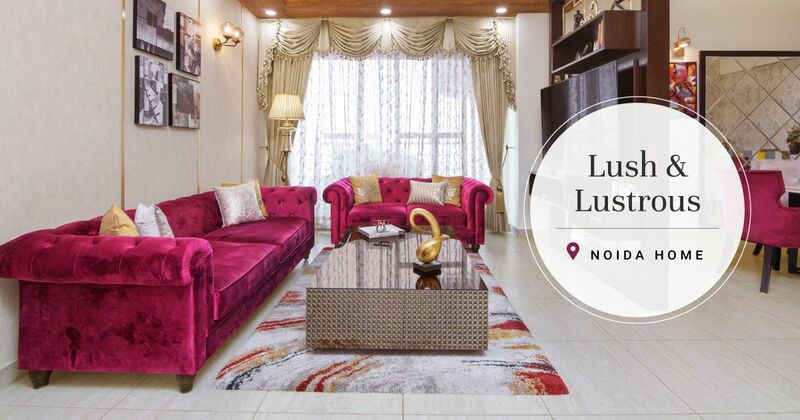 If you happen to own a home that is quite spacious but you like to keep things subtle and maintain open spaces, then this one’s for you. 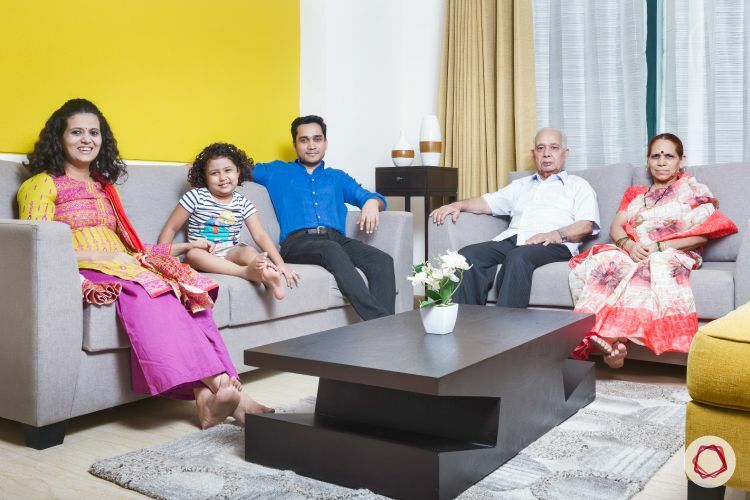 For working couple, Rashmi and Rajendra, their home had to be an extension of their personality. 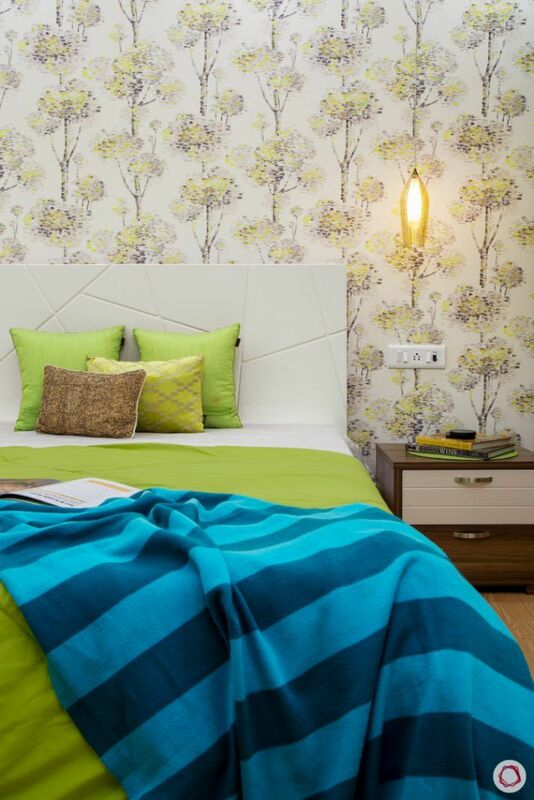 This 3BHK at Jaypee Kosmos is nothing short of a dream for them. 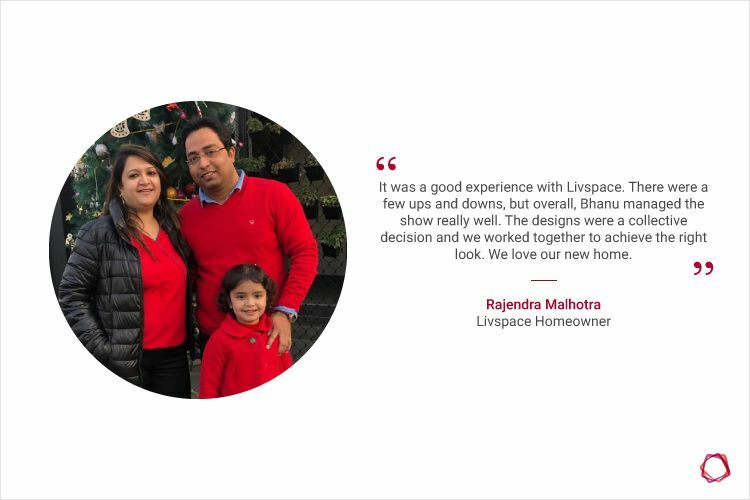 For Rajendra, it was an easy task to get his home designed by Livspace, since his office is situated right opposite the Experience Center in Okhla. After numerous visits and a couple of discussions, they signed us up for designing their home. Their designer, Bhanu Mittal is great at her work and it took her no time to set sail on this one. 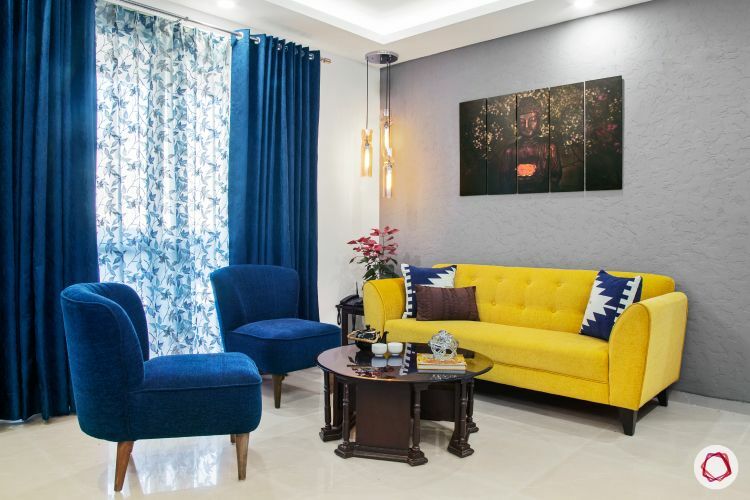 While the couple came with a lot of ideas for their home, it was Bhanu who stitched it all together. They wanted a space that does not feel cluttered or hinder movement. 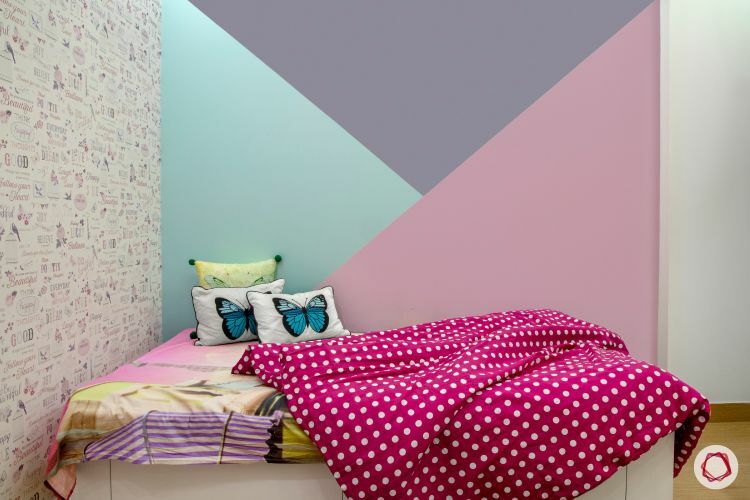 This address is defined by the use of lots of subtle wallpapers and bright pops of colour. Scroll down for a tour of this home. This living room is nearly perfect in terms of colour coordination and lighting, wouldn’t you say? 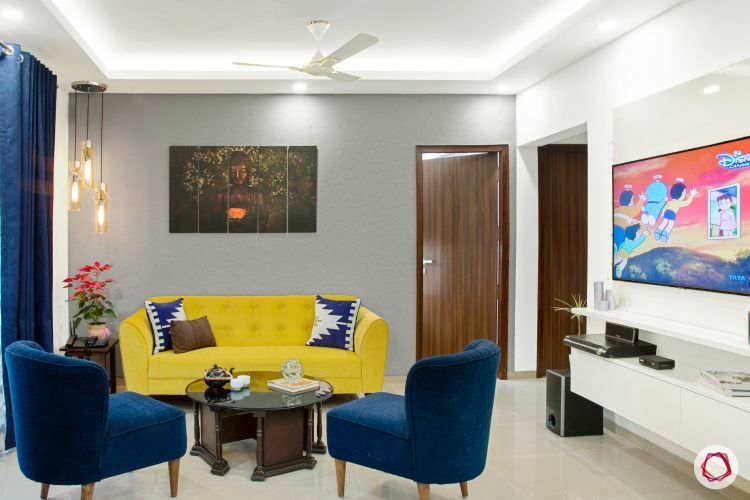 Since the couple was very keen on having only neutral colours at home, Bhanu suggested they introduce a dash of colour with pop seating. 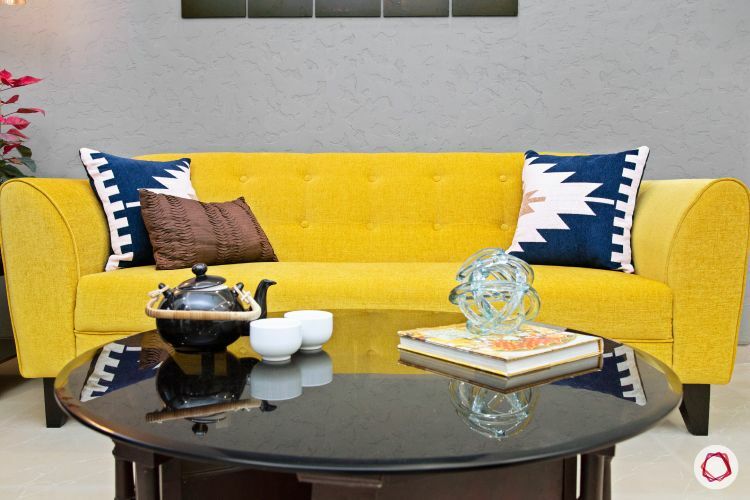 Therefore, she gave them a mustard yellow sofa and paired it with navy blue accent chairs. 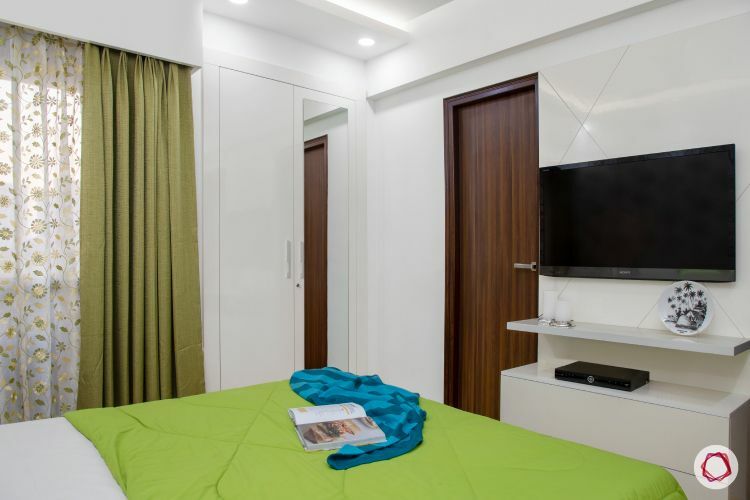 The rest of the room wears a subtle look with a grey wall and a minimal, all-white laminate TV unit. 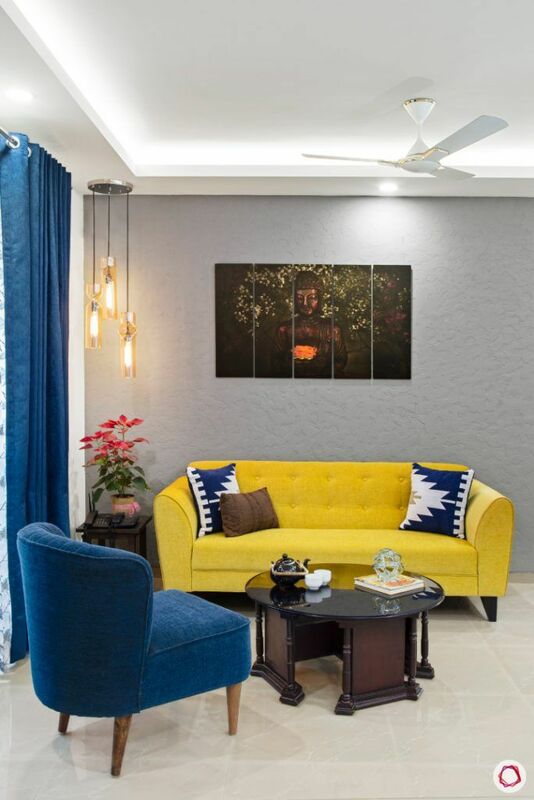 When it comes to illuminating the space, Bhanu has given them cascading pendant lights in one corner and LED lights in the false ceiling with cove lights that create soft focus. The drapes also play match with the upholstery to create visual harmony. 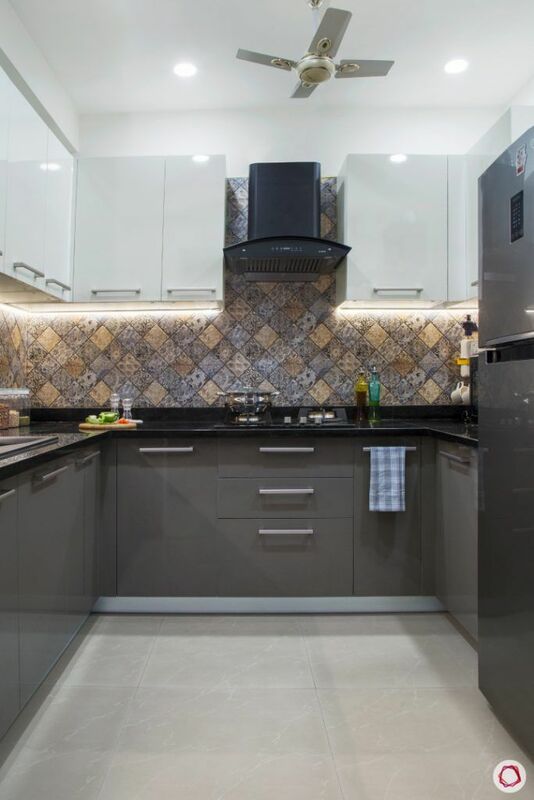 In conversation, Bhanu tells us that the kitchen provided by the builders was not up to the mark and the couple wanted to revamp the entire space. 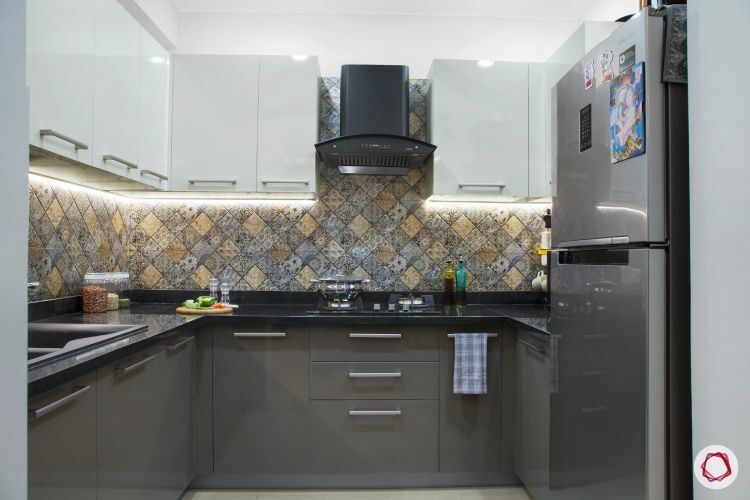 Keeping with the subtle colour scheme, she gave them steel grey cabinets at the bottom and frosty white for the overhead cabinets. 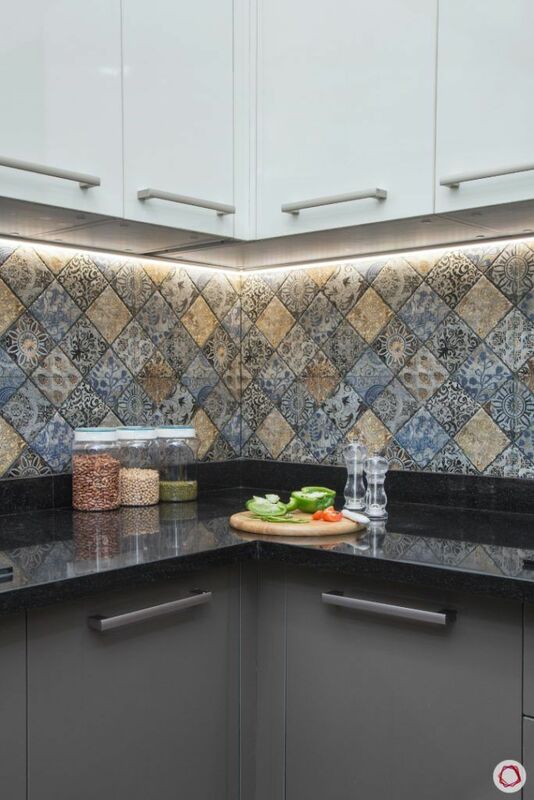 What brings out the beauty of this kitchen are the profile lights that double up as task lights below the overhead wall units. 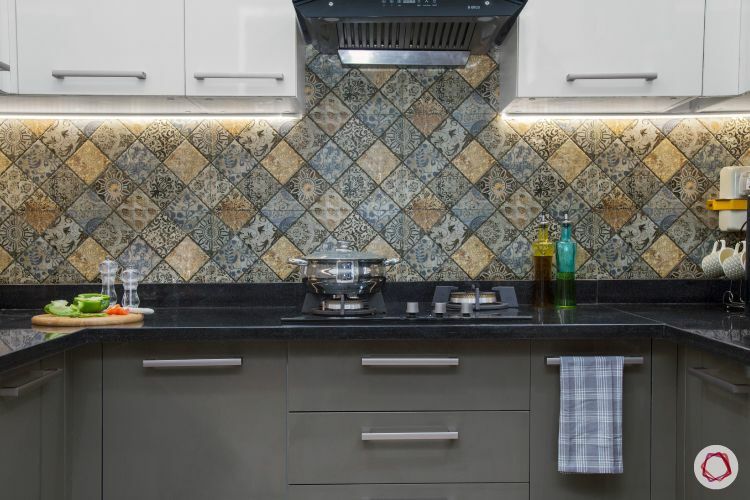 The countertop is jet black granite, while the backsplash flaunts printed tiles for that finishing touch. 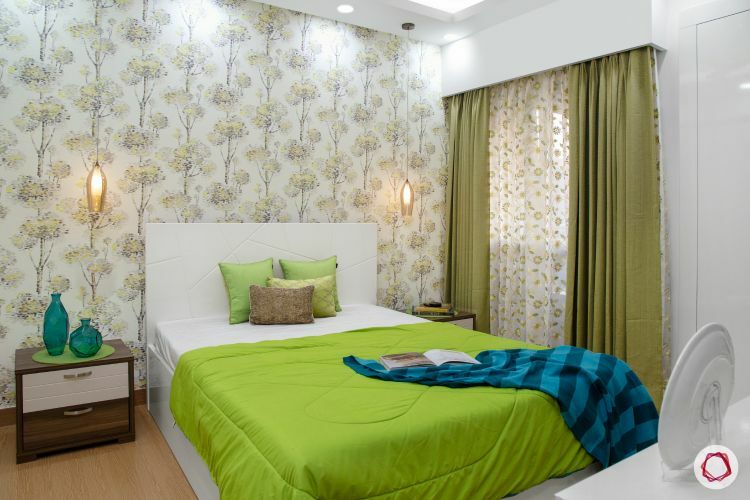 The master bedroom follows a green and white theme in terms of colour. The olive green prints on the wallpaper add a touch of warmth, while drapes in the same shade are in perfect sync with it. If you notice carefully, the pattern on the headboard has been replicated for the TV unit to keep the vibe low-key. All the doors at home were also redone and laminated in a dark wood finish. 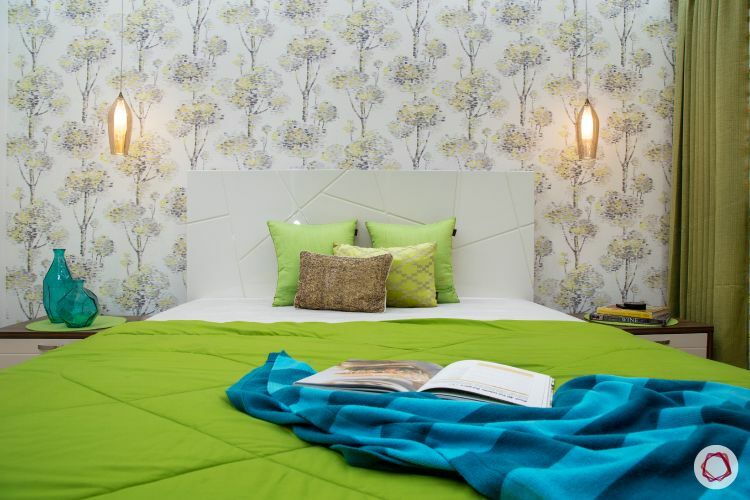 Can you guess who selected the pretty wallpaper for this room? Well, it’s their little one, Kiara. Very few would actually believe that a little girl can have so many iterations for a wallpaper. 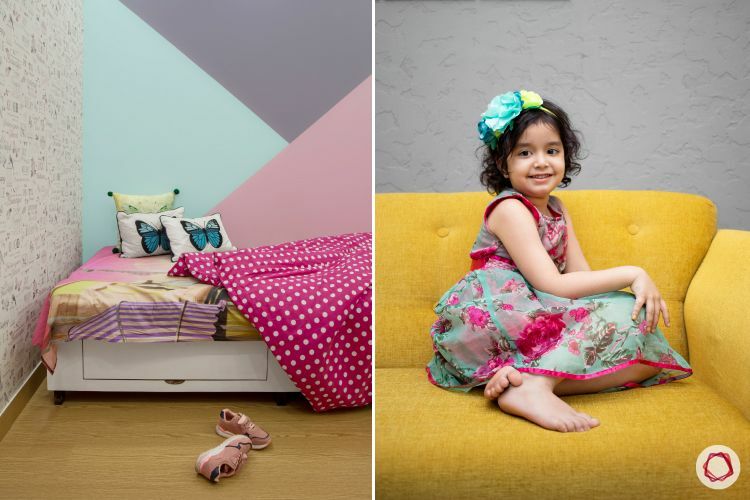 But yes, Bhanu sat down with her to understand what she likes and dislikes so that she could give her a room that she would love goofing around in. 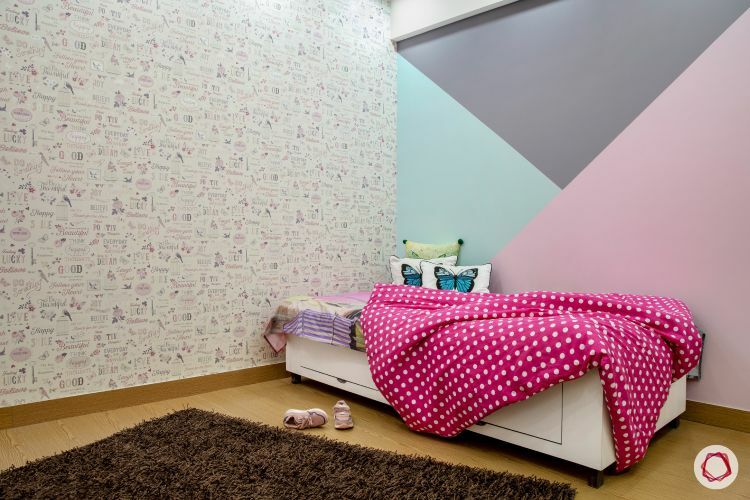 Bhanu has played with pink and morning blue for one of the walls in this bright room. To keep the rest of the look simple, she gave her a white bed and a white laminate study table. With push to open cabinets on the wall and cute pin-board, this study unit is compact and stylish. The whiteboard with a drawer at the bottom is utilised by her tutors when they come to teach her. The glass wall shelves are at a significant height so that Kiara cannot reach for the toys and throw them all around. We love the cheerful vibe of this room! 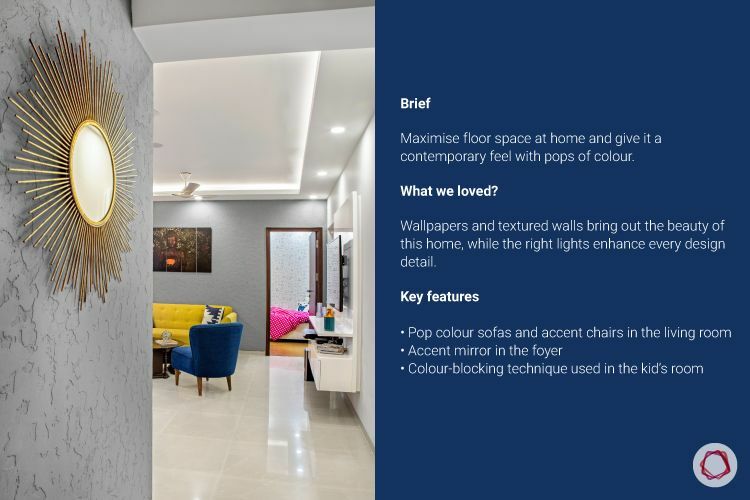 If you liked this cheerful home, we are sure you will love this Chic 4BHK Decked up in Luxurious Interiors at Antriksh Golf View, too.